Acquired directly from the artist by Harry Torczyner on 28 July 1960. "Surrealist Art Displayed," The Dallas Morning News, 9 December 1960, section 1, p. 14 (illustrated). S. Tillim, "Month in Review," Arts Magazine, December 1961, p. 45. Rhetorique (Tilleur-lez-Lige), no. 4, January 1962 (illustrated). "The Vision of Ren Magritte," Arts Magazine, September 1962, p. 15 (illustrated in color). P. Waldberg, Ren Magritte, Brussels, 1965, p. 110 (illustrated in color). A.M. Hammacher, Ren Magritte, New York and London, 1974, p. 150, pl. 43 (illustrated in color). A. Robbe-Grillet and R. Magritte, La belle captive, Brussels, 1975, pp. 26-27 (illustrated). C.M. Bloomer, Principles of Visual Perception, New York, 1976, p. 53 (illustrated). H. Kramer, "'European Masters,' A Show and an Era," New York Times, 31 December 1976, section C, p. 16 (illustrated). J. Russell, "Art: Treasury of Moderns at Janis Gallery," New York Times, 19 October 1979. G. Melly, "The World According to Magritte," Sphere, vol. 3, no. 1, January-February 1985, p. 18 (illustrated in color). H. Torczyner, The Origins of Ren Magritte's "Le tombeau des lutteurs" (unpublished manuscript), 26 September 1985. P. Gimferrer, Magritte, Paris, 1986, pl. 105 (illustrated in color). Letter from R. Magritte to A. Bosmans, 23 July 1960, in R. Magritte (F. Perceval, ed. ), Lettres Andr Bosmans 1958-1967, Paris, 1990, pp. 120-121. J. Meuris, Magritte, New York, 1990, pp. 160-161 (illustrated in color). D. Sylvester, Magritte, The Silence of the World, New York, 1992, p. 281 (illustrated in color). Letter from R. Magritte to H. Torczyner, 21 May 1960, in H. Torczyner, L'ami Magritte: correspondance et souvenirs, Antwerp, 1992, no. 134. Letter from R. Magritte to H. Torczyner, 11 June 1960, in H. Torczyner, L'ami Magritte: correspondance et souvenirs, Antwerp, 1992, no. 135. Letter from R. Magritte to H. Torczyner, 30 June 1960, in H. Torczyner, L'ami Magritte: correspondance et souvenirs, Antwerp, 1992, no. 139. Letter from R. Magritte to H. Torczyner, 4 July 1960, in H. Torczyner, L'ami Magritte: correspondance et souvenirs, Antwerp, 1992, no. 140. Letter from R. Magritte to H. Torczyner, 18 July 1960, in H. Torczyner, L'ami Magritte: correspondance et souvenirs, Antwerp, 1992, no. 144. Letter from H. Torczyner to R. Magritte, 16 August 1960, in H. Torczyner, L'ami Magritte: correspondance et souvenirs, Antwerp, 1992, no. 148. Letter from R. Magritte to H. Torczyner, 19 August 1960, in H. Torczyner, L'ami Magritte: correspondance et souvenirs, Antwerp, 1992, no. 149. H. Torczyner, L'ami Magritte: correspondence et souvenirs, Antwerp, 1992, p. 46 (illustrated in color), pp. 145-146, 151 (illustrated), 154, 159, 161, 170, 171, 238, 251, 252 (illustrated), 253. B. Schiff, "The artist who was master of the double take," Smithsonian Magazine, vol. XXIII, September 1992, pp. 50-51 (illustrated in color). D. Sylvester, S. Whitfield and M. Raeburn, Ren Magritte, Catalogue Raisonn, London, 1993, vol. III (Oil Paintings, Objects and Bronzes 1949-1967), p. 326, no. 912 (illustrated). R. Magritte, Magritte/Torczyner: Letters Between Friends, New York, 1994, p. 57 (illustrated). H. Haddad, Magritte, 1996, p. 130 (illustrated in color). Kunstsammlung Nordrhein-Westfalen, Ren Magritte: Die Kunst der Konversation, Dusseldorf, 1996, p. 12 (illustrated). Dallas, Museum for Contemporary Arts, and Houston, Museum of Fine Arts, Ren Magritte in America, December 1960-March 1961, no. 17. New York, Albert Landry Galleries, Ren Magritte in New York Private Collections, October-November 1961, no. 8. Minneapolis, Walker Art Center, The Vision of Ren Magritte, September-October 1962, no. 16 (illustrated). New York, The Museum of Modern Art; Waltham, Massachusetts, Rose Art Museum, Brandeis University; The Art Institute of Chicago; Pasadena, Art Museum, and Berkeley, University Art Museum, University of California, Ren Magritte, December 1965-November 1966, pp. 18 and 40, no 76 (illustrated in color). New York, Sidney Janis Gallery, XXth Century European Masters, December 1976-January 1977, no. 37. New York, Sidney Janis Gallery, Magritte, December 1977, no. 22. New York, Sidney Janis Gallery, Masters in 20th Century Art, October-November 1979, no 43. New York, Sidney Janis Gallery, Early Twentieth Century Masters, December 1981-January 1982. New York, The Metropolitan Museum of Art, Magritte, September-November 1992, no. 119 (illustrated in color). Montreal, Museum of Fine Arts, Magritte, June-October 1996, pp. 46 and 156, no. 73 (illustrated, p. 46; illustrated in color, p. 156). April 12, 1960, it was a Tuesday. It was Belgium. I arrived in Brussels, en route to New York, returning from a visit to Moscow and Leningrad. That very day I went to the cozy white house on the Rue de Mimosas to visit with Ren and Georgette Magritte. Ren asked for a report. A travelogue was out, but a discussion of my traditional tour of the Tretiakov, Pouchkine and Ermitage Museums started. Ren asked if I had seen the work of any 'Tachist' painters in the Soviet Union. 'Tachist' was the word he always used as a label for the then dominant school of abstract expressionist artists and their followers. "They painted white on white, and they believe that this is an achievement." I remarked that one could perfectly well paint white on white, and achieve a result, figurative, surrealist, and Magrittian and said "from time to time you have filled a room with a green apple, which puts one's teeth on edge. Why don't you paint for me a white rose in a white room, and a window with a view of a snow landscape?" "I believe that you will be bowled over (revers) by a very much leftist arrival" and asked if the painting should be sent to my home or my office. On July 4th he mailed the measurements of the painting. "I am happy to hear about the welcome you've given Le tombeau des lutteurs. The date 1944 shows that during that period the painting I envisaged--attempting to bring it into harmony with the Impressionist spirit--wasn't always (in 1954 [sic]) in accord with that spirit. 'My usual manner' was sometimes, rather always, there to testify that I would recover once and for all. The 1944 pictures, such as Le tombeau des lutteurs, were, in fact, painted in 'my usual manner,' which has since come to be the only one that I feel is truly necessary for painting, without fantasy or eccentricity, ideas already 'sublime' enough that they do not need to be anything but a precise description. I firmly believe that a beautiful idea is ill served by being 'interestingly' expressed: the interest being the idea. Those ideas that need eloquence to 'get across,' for example, are incapable of making an effect on their own. This is one of my convictions--which are often solely tested by all kinds of interpreters, who try to add something 'of themselves' when they recite poems, paint pictures, etc." It seems to me that given the wit (or rather, the lack of wit) prevailing in 'professional' circles this picture may have some chance of being appreciated through a misunderstanding. Indeed with the help of blindness, it could be taken for an 'abstract' painting, Tachist, or what have you. The importance of the colour red, will undoubtedly beat interest into the sensibilities of the amateur of currently fashionable paintings as though they were so many bass-drums." Magritte's reference to 1944 suggests that he was thinking of his first painting of a giant rose, L'invitation au voyage of that year (fig. 1). The model for Le tombeau des lutteurs was probably one of the various illustrations of roses which Magritte clipped from magazines, catalogues and books (e.g. fig. 2). (fig. 1) Ren Magritte, L'invitation au voyage, 1944. (fig. 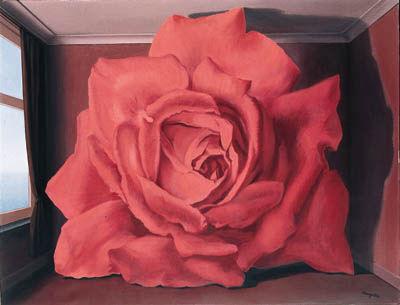 2) Illustration of roses found among Magritte's belongings. Art Collection, First National Bank of Chicago.